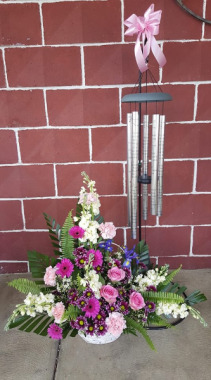 This combination includes a sympathy chime of your choice and a sympathy arrangement to compliment the chime. Some chimes that can be selected are Always Near, Comfort and Light, You are Missed, and God Has You. You are welcome to call to see the chimes available! 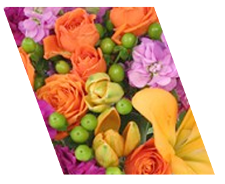 Call 419/529-9739 Price point 1 consists of a 30" chime with a medium basket arrangement. 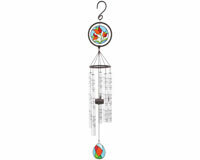 Price point 2 consists of a small 30" chime with a large basket arrangement. Price point 3 consists of a 44" chime with a large basket arrangement. This silver chime reads the words of Amazing Grace along the barrels. ***PRICE POINT 2 includes the rental of the chime stand for displaying the chime at the funeral home. ***PRICE POINT 3 includes a plant at the base of the chime. This chime reads, "Our Family chain is broken, And nothing seems the same... But as God calls us one by one, The chain will link Again. Price point 1 includes the chime, Price point 2 includes the rental of the chime stand and Price point 3 includes a plant or flower arrangement to make the gift even more special. 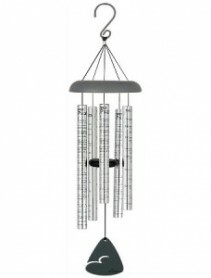 This beautiful chime has a comforting poetic message scripted on the dazzling silver tubes. The poem read, "God didn't promise days without pain, laughter without sorrow, nor sun without rain, but He did promise strength for the day, comfort for the tears, and light for the day." 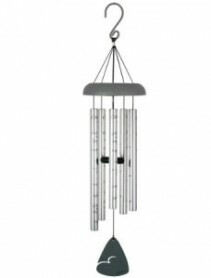 Carson is a leading manufacturer of wind chimes and any recipient of this lovely gift will enjoy the full tones and rich resonance of this timeless design. ***PRICE POINT 2 includes the rental of the chime stand. ***PRICE POINT 3 includes a plant at the base of the chime. 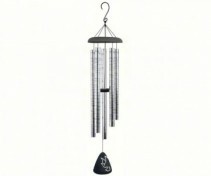 This beautiful chime has the meaningful poem "Memories" scripted on the shining silver tubes. Carson is a leading manufacturer of wind chimes and any recipient of this wonderful gift will enjoy the rich tones and resonance of this timeless design. 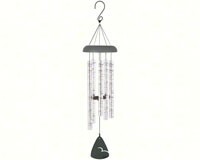 ***PRICE POINT 2 includes the rental of the chime stand for displaying the chime at the funeral home. ***PRICE POINT 3 includes a plant at the base of the chime. This beautiful chime has the words "In memory of a life so beautifully live and of a heart so deeply loved" written on each tube. Price point 1 is the chime alone, price point two includes the rental of a chime stand for display purposes and price point three includes a nice arrangement of flowers at the base of the chime setting of the entire gift making it even more special. 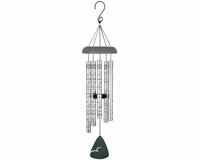 This beautiful chime has a comforting poetic message scripted on the dazzling silver tubes. The poem reads, "I thought of you with love today, But that is nothing new. I thought about you yesterday, and the days before that, too. I think of you in silence, I often speak your name, All I have are memories, and your picture in a frame. Your memory is my keepsake, With which I will never part, God has you in his keeping, I have you in my heart." Carson is a leading manufacturer of wind chimes and any recipient of this lovely gift will enjoy the full tones and rich resonance of this timeless design. ***PRICE POINT 2 includes the rental of the chime stand. ***PRICE POINT 3 includes a plant at the base of the chime. 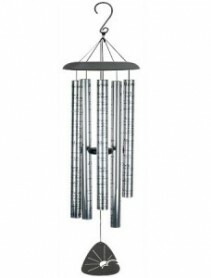 This dazzling chime has the meaningful and comforting scripture, the 23rd Psalm scripted on the shining silver tubes. 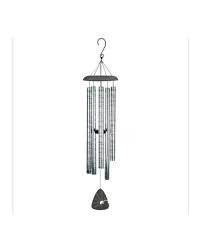 This beautiful Old Testament poetry is a source of hope and peace.Carson is a leading manufacturer of wind chimes and any recipient of this gorgeous gift will enjoy the rich tones and resonance of this timeless design. ***PRICE POINT 2 includes the rental of the chime stand. ***PRICE POINT 3 includes a plant at the base of the chime.